Our new S+K Web Site is Live!! 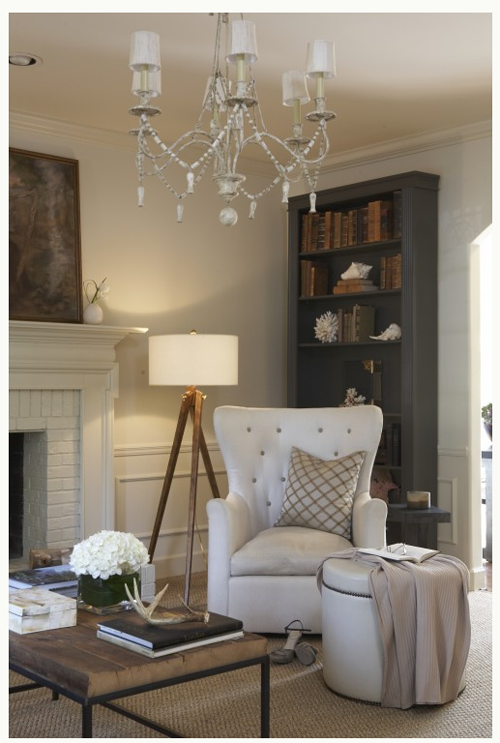 Comfortable meets formal with soothing colors: not your grandmother’s living room. 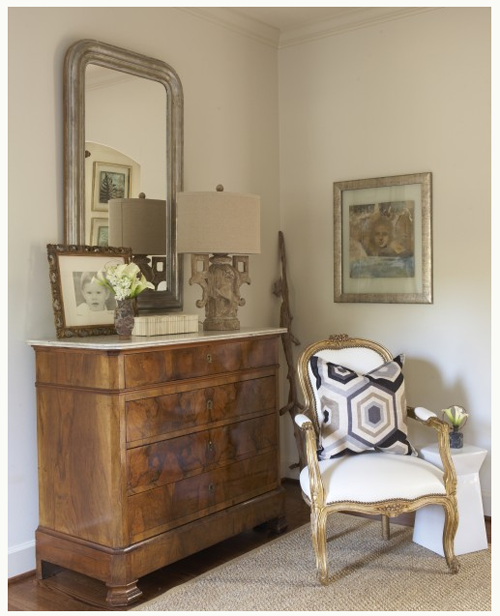 I am totally inspired by these photos I found while online shopping for an entryway rug. It’s amazing what you can find when you are not looking. I am now on high alert for any accessory that is textured, weathered, or patina-d (is that a word?). 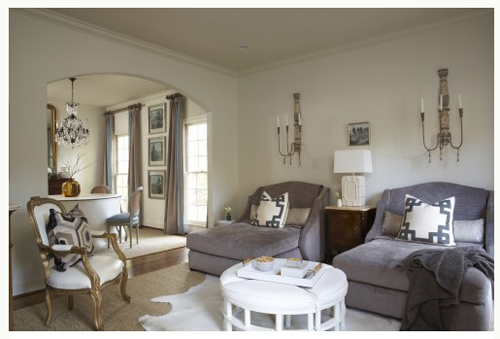 Check out these rooms showcasing the formal look with a inviting feel. They have a soothing combination of elegance and comfort. 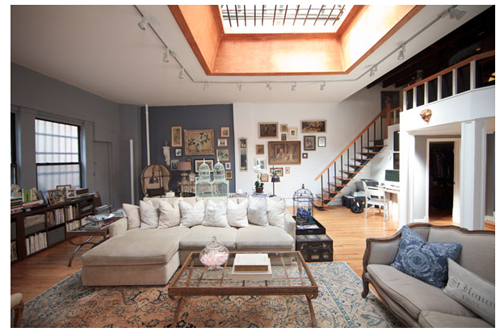 Some of the photos are of Christian Siriano’s apartment in New York. 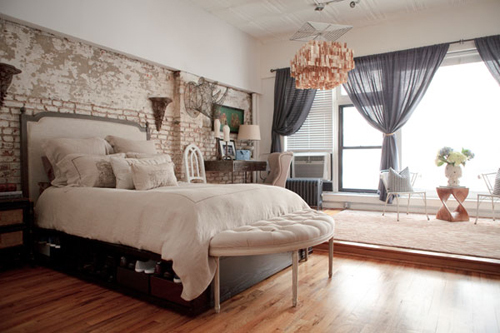 They combine vintage and modern with cute birdcages, pillows from Restoration Hardware and vintage furniture. I wonder if he will let me move in. 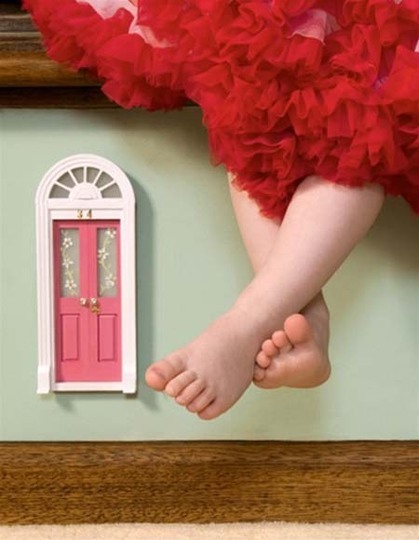 fairy door! is this just cute or what? If you have kids and haven’t visited ohdeedoh you must-go-now! 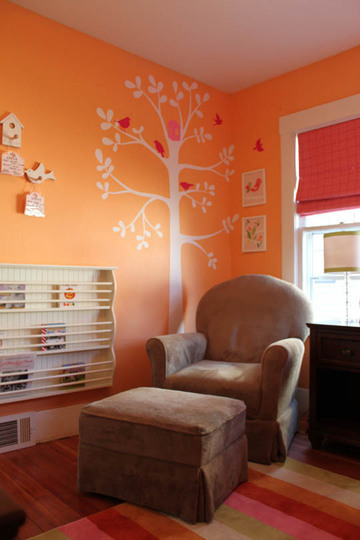 It is a super informative site for the latest and greatest ideas in kids room decorating. Plus ideas on how to live with kids in a small space without feeling like you live in a daycare – golden! 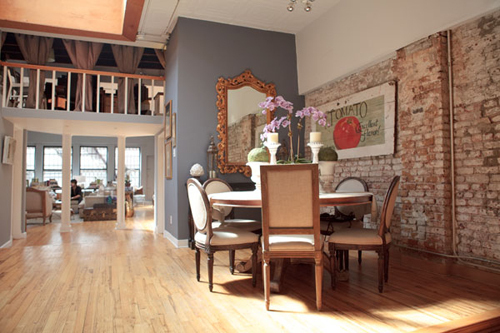 It is a part of the apartment therapy site – which speaks for itself. They have great tips for renters or owners of small spaces, or just people like me who have a house with smaller than life bedrooms. Do your kids share a room? 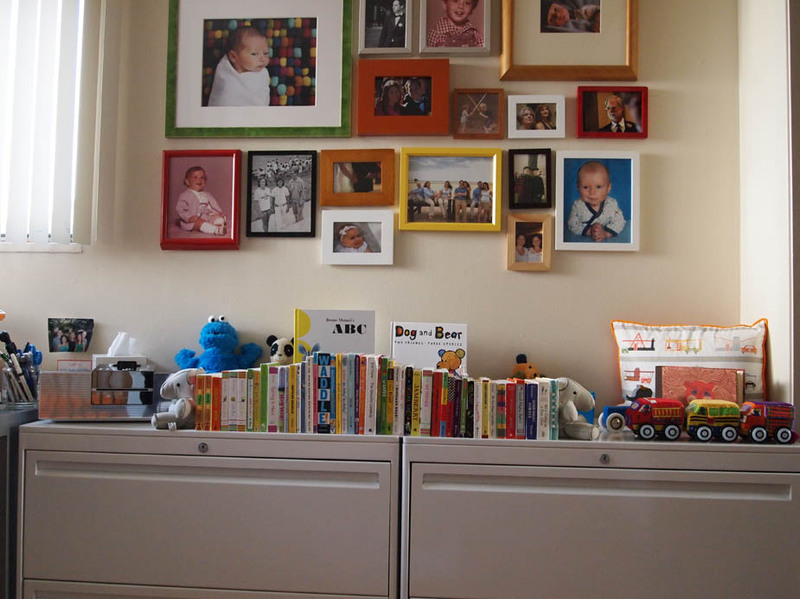 There are tips for 2 kids, 3 kids, and girl and boy shared rooms. 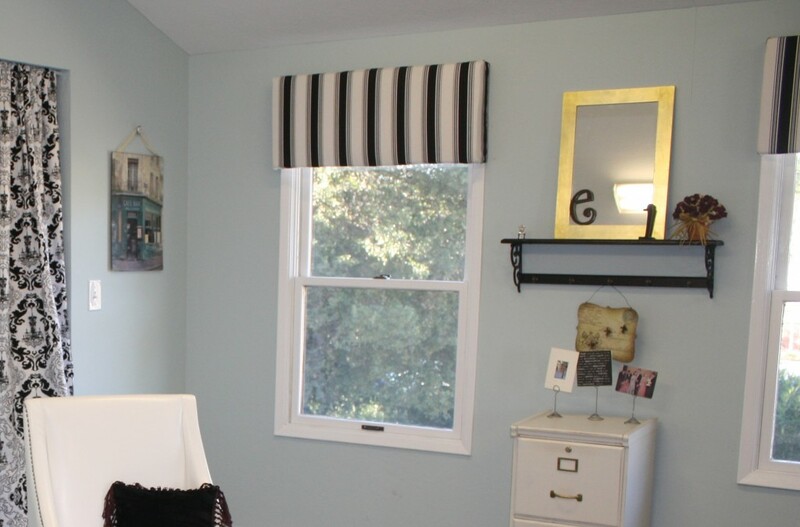 There are oodles of pictures to go through in their kids room tours section. (Heh, I used the word oodles and now I am all distracted). it's cute and it fits! room for half of a brady bunch! I procrastinated on getting my first baby’s nursery ready. Not the wisest plan, since he could have come early (he was late) or I could have been too big (I was fine), but I think I work best under pressure. And I lean towards a state of denial sometimes (baby? What baby?). But I’d been reading enough about having a baby that I knew I’d be sleep-deprived and potentially cranky, so I wanted the room to be colorful and cheery for the 3 a.m. feedings. 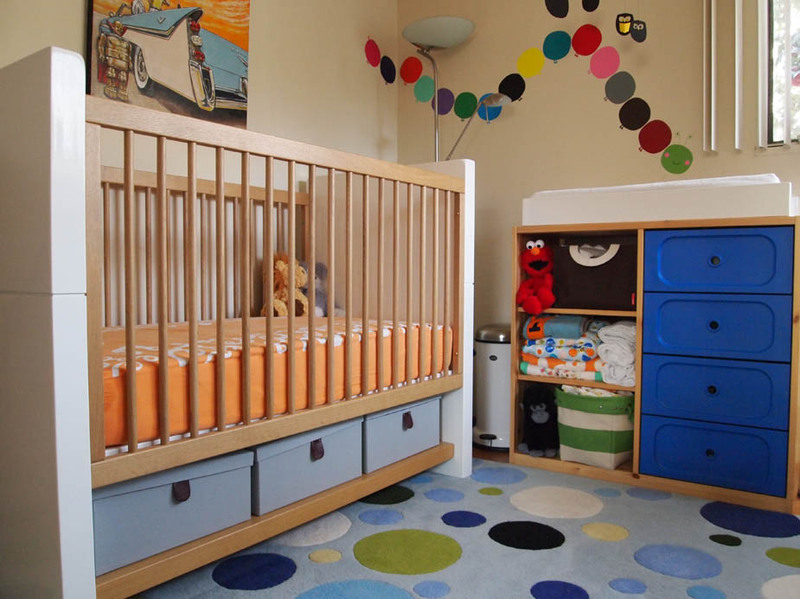 I wanted a sleek, modern crib and became obsessed with the Netto line. 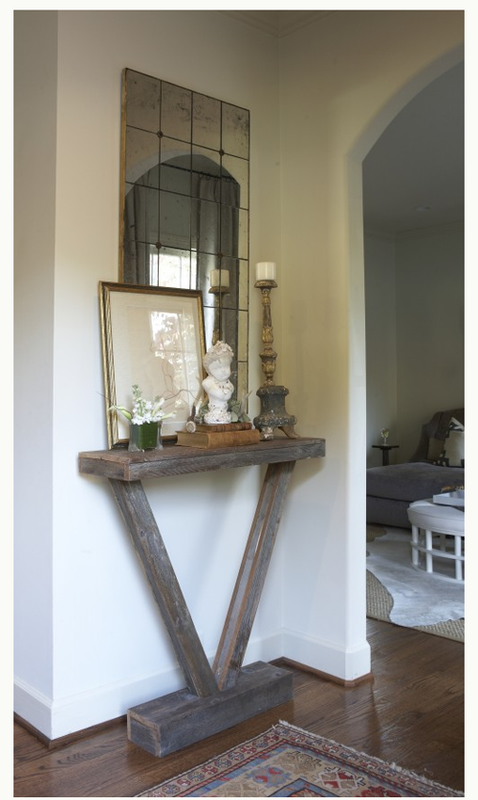 These are pretty spendy (and now owned by Maclaren), but luckily a local boutique was selling a floor sample of a discontinued model, so we got a good price on it (and I didn’t put too much thought into the fact it cost more than the headboardless metal frame my husband and I sleep on). 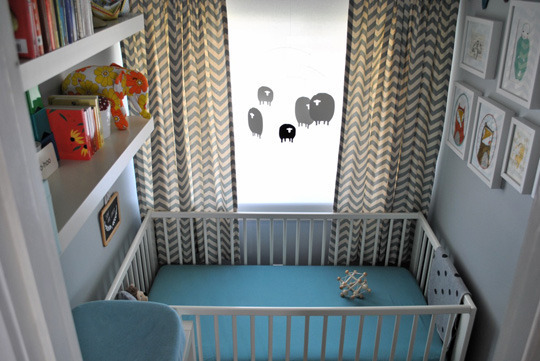 I wanted crib sheets in my favorite color of orange, and the pattern along the edge seemed like it might interest my son when I put him down for a nap (this was before I knew he would end up napping on me every day for 5 months). 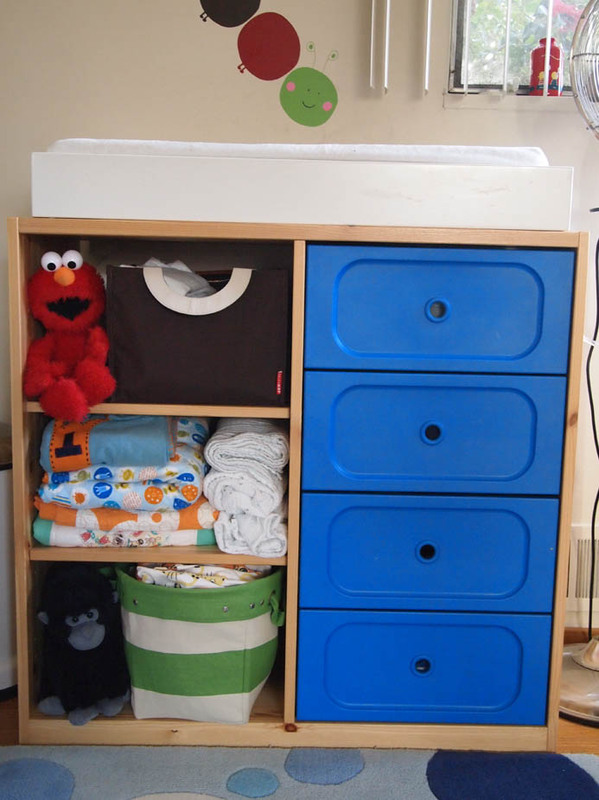 IKEA has a lot of fun baby furniture, and I loved the bright pop of cobalt blue and peephole pulls in these dresser drawers. And I could put all the stuffed animals I’d been buying for the baby (okay, for me) on the shelves. I figured I had a good eight months to keep things organized on the shelves before he started tearing everything apart. I also wanted a plush, cozy rug underneath my feet (since the hardwood floor can be cold at 3 a.m.), and I found one at Overstock that I thought had a modern design that could appeal to a child too (and you can’t beat their shipping prices). With the furniture taken care of I turned my attention to the pale, off-white walls that are in every room of our rental apartment. It would be easier to become President of the United States than ask my landlady to paint the walls. But luckily there are so many fun decals out there, and Blik (online) has a huge selection of cute stickers for your walls. I love the colorful caterpillar on the wall next to the diaper changing table because I think it’s a fun way to teach my son colors and numbers (this is when he’s not screaming and writhing around and arching his back and I’m doing everything I can not to get poo all over me). Our son’s room also has to function as an office for my husband, who needs to keep files on hand. When he told me my cute, red metal, two-drawer filing cabinet that I used for years as a single gal wasn’t big enough, I started to have panic attacks of those gray, four drawer monstrosities giving my son (okay, me) nightmares. So I contacted a local interior designer who outfits office spaces and she found these sleek, white metal filing cabinets. 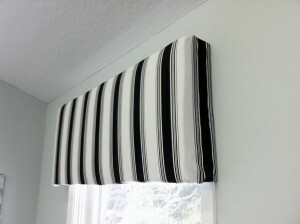 They also cost more than the metal frame my husband and I sleep on, but I do love the way they look. They’re also a kid-friendly height for my son to access board books, stuffed animals and toys. And since the space above the filing cabinets was big, I thought of filling it with family photos, with the hopes that our son would learn to recognize his grandparents (Oma, Opa, Bubbie and Poppie) when they came to visit, since they live thousands of miles away. Luckily we also have Skype to help us with that. Who says you have to do without cuteness while on a budget. Here is an easy window dress up project that even I can do. These windows in our office were originally covered in skinny white plastic horizontal blinds. (Cue the theme for the movie “Psycho”) I for one dislike plastic window blinds very much. I am sure there are some uses for these contraptions such as cheese slicers or garden rakes, but they just don’t do windows justice. Wood blinds, on the other hand, are fine which would lead to some comments about my possible plastic discrimination. I blame it on the burnt orange (!) plastic blinds I had to live with in my teenage room at my parents home. But back to the project. 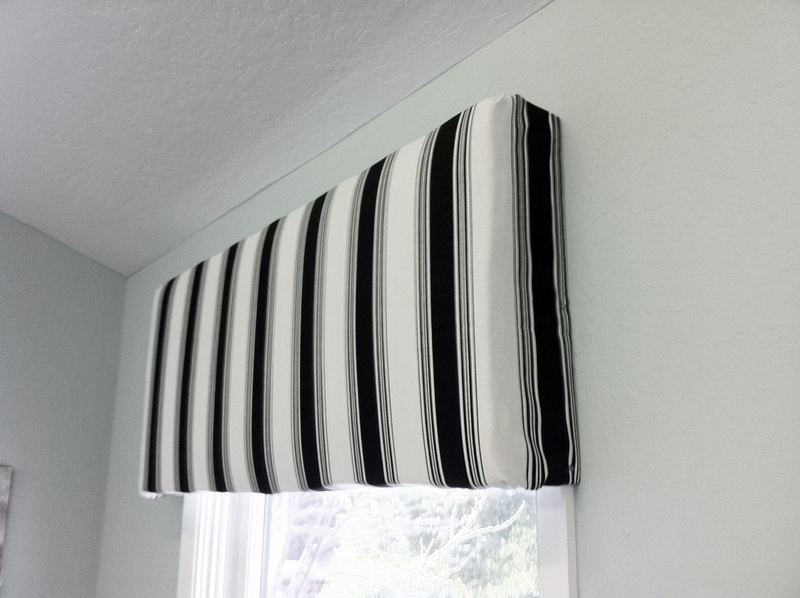 You can create quick custom valances that look totally cute without breaking your budget. Erin’s super crafty mom made these for us with fabric, batting and foam board. The fabric is wrapped around the board and stapled to the back. These are light enough to be easily nailed to the side of the window trim. Renting and scared of your landlord? 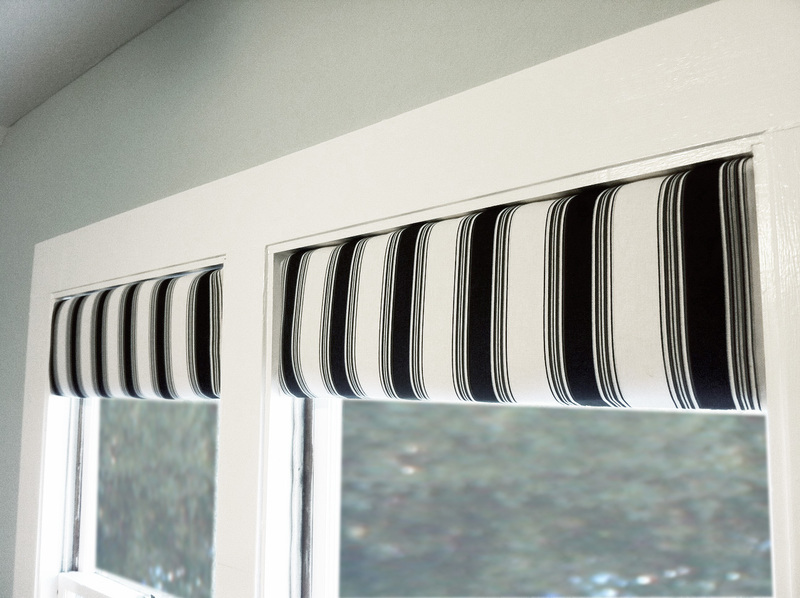 No need to cover your tracks: some were sized just a bit smaller than the window opening and slide up into the window pane with no nails, glue, or commitment! A renters dream!